Some of the same characters that played leading roles last time. The value of the US housing market has ballooned to $26 trillion. In many markets, prices exceed even the peak or the prior bubble that blew up so spectacularly. This construct is weighed down by $14 trillion in mortgage debt, or about 76% of US GDP. Of that, $10 trillion is owed on one- to four-family residences. The numbers are big – and they matter. But who’s doing the lending? More and more: nonbanks, evocatively called “shadow banks.” They have now overtaken commercial banks “to grab a record slice” of government-guaranteed mortgages, Attom Data Solutions reported in its housing report. [T]hey typically borrow from Wall Street hedge funds, private investors, or banks to make loans, then quickly sell these mortgages to Fannie Mae and Freddie Mac and other buyers, so they can repay their loans and start the process over again. 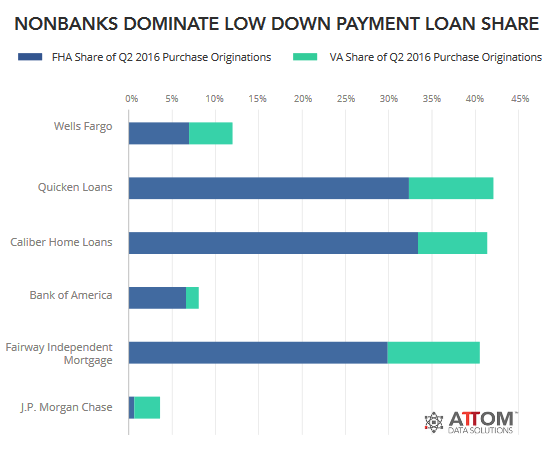 Nonbank lenders dominate the origination of mortgages insured by the Federal Housing Administration (FHA) and by the Veterans Administration (VA), the riskier corner of housing lending due to no down payment or low down payment loans and poor-credit buyers. So subprime mortgages with low or no down payments. These government entities don’t actually make loans; they buy loans from lenders, package them into mortgage-backed securities, and guarantee them to make investors whole if the mortgages default. Wells Fargo is still the largest mortgage lender by far, with 26,262 purchase mortgage originations in the second quarter, according to ATTOM. 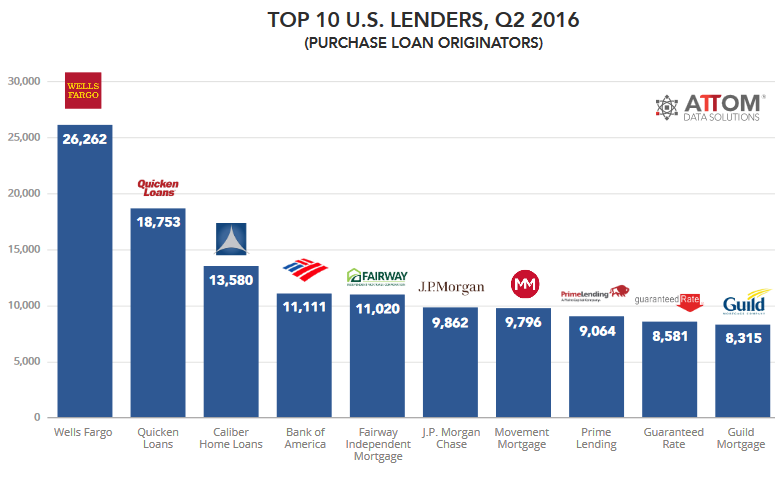 But number two is nonbank Quicken Loans with 18,753 originations, followed by Caliber Home Loans with 13,580 originations, followed by Bank of America, Fairway Independent Mortgage, JP Morgan Chase, Movement Mortgage, Prime lending, Guaranteed Rate, and Guild Mortgage. 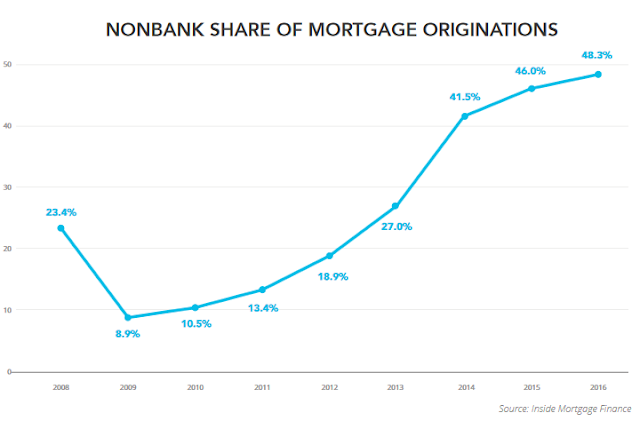 Of these top ten originators, shadow banks originated 63% of the mortgages! These shadow banks are barreling into the market by going after riskier borrowers and government guaranteed no-down payment or low down payment mortgages, with impeccable timing, now that the Fed’s monetary gyrations have inflated home prices nationally past the prior bubble peak, and in many markets far beyond the prior bubble peak. In California, some of the largest nonbank lenders include PennyMac, AmeriHome Mortgage, and Stearns. All three are headquartered in Southern California, the epicenter of last decade’s subprime mortgage lending industry. And all three companies are run by executives who formerly worked at the once- giant Countrywide Financial, the now defunct subprime lender founded by Angelo Mozilo (Bank of America bought Countrywide for $4 billion in July 2008). PennyMac, a fast-growing nonbank lender, is run by Stanford Kurland, a former Countrywide Home Loans executive and IndyMac director. Stearns, a Santa Ana, California-based nonbank lender, is run by Brian Hale, a former Countrywide division president. And Joshua Adler, who is AmeriHome’s managing director of secondary marketing, held similar roles at Countrywide and Bank of America. These shadow banks dominate in mortgages that are insured by the FHA and the VA, including no-down-payment and low-down-payment mortgages for buyers with subprime credit ratings, the riskiest mortgages out there. Thus, FHA and VA backed loans have jumped from 6% of all purchase originations in 2006 to 30% in Q3 2016. Jumbo loans are not insured by the government. Nonbanks and the government are picking up the rest. Increasingly, the federal government – FHA, VA, Fannie Mae, Freddie Mac, and Ginnie Mae – has played a larger role in the mortgage financing industry as the large depository banks retreat from the home loan market. In all, these five entities own or have guaranteed more than $5 trillion in mortgage risk…. That’s about half of the outstanding mortgage risk. The role of the government entities that insure high-risk subprime mortgages has soared: The FHA insured 3.4% of all mortgage originations in Q1 2006; by Q2 2016, its share had jumped to 17.5%. Over the same period, the VA’s share soared from 0.7% to 8.7%. It is largely via this conduit of the shadow banks that the nationalization of the riskiest end of the mortgage industry is proceeding. It has now become completely dependent on government guarantees. This artificially pushes down mortgage rates as the risk is born by taxpayers. Low mortgage rates and no-down-payment and low-down-payment subprime mortgages are precisely what is required to inflate already inflated home prices further and drive Housing Bubble 2 to its peak. It creates the foundation for the next housing bust, where taxpayers and/or the Fed, will once again bail out investors in mortgage-backed securities. Why? Because politicians, always eager to buy votes, refuse to get the government out of the mortgage industry. But there is no risk, we hear constantly. Defaults are at a record low. Same as just before the last housing bust. When home prices soar, no one defaults. You can just sell the home and payoff the mortgage. The problem arises when prices head south.